These are some of the good things that were said about the first edition of Treat Me Nice. The first edition is sold out but the second edition will be released very early in 2012. ‘Highly enjoyable and a stimulating read.’ Paul Simpson, author ‘The Rough Guide To Elvis’. ‘A formidable treatise. This book deserves to be noticed. Cogently written and totally absorbing and recommended reading.’ Nigel Patterson, Elvis Information Network. ‘Students should find room for Treat Me Nice. If only to understand what makes an academic study stand out from the crowd.’ Chris High. The Writers News. ‘Howard Jackson can write. The reader is in safe hands.’ Clive Bradley, TV and film scriptwriter. ‘A thoughtful dissection of the King.’ Queen Creole. ‘The Frankenstein metaphor works surprsingly well.’ 4Harrisons. ‘Love the review of Long Black Limousine and how it is combined with It Hurts Me.’ Bob 78s. ‘A worthwhile book that is probably essential.’ How Great Thou Art. ‘What I like about the book is that it is not just for Elvis fans. The comparison between Elvis and the monster is a fascinating read.’ Even better than the real thing. ‘Treat Me Nice is very, very clever.’ City Fan, Stockport. ‘Unputdownable. Immediately after reading it I downloaded every Elvis gospel track I could find.’ Wirral baptist. ‘I have read the book twice and I am not even a big Elvis fan. Second time is better again.’ Duggie Greenall. ‘I was awed by the information contained within the book. Made me realise why Elvis is so important to his fans.’ Exiled inGreece. ‘I read a lot of this book aloud to my boyfriend and parts of it made us laugh out loud. There is a lot of sly humour in the book which you wouldn’t necessarily expect from a book about music.’ Unity Banana. As a work that is clearly close to Howard Jackson’s heart, Treat Me Nice provides an unusual yet thought provoking comparison between Presley as “created” by his own “Mad Professors” (primarily RCA, the movie studios & Colonel Parker) and the disillusionment, isolation and, ultimately, abandonment that ensued as a result, to that created by Mary Shelley for her famed creature. That Presley often rebelled against the control of his “masters” but that, more often than not they prevailed is without doubt, but the question as to whether Presley as a talent worthy of the title King ever truly existed is one that, here, is deftly and interestingly explored with great panache. As with any academic undertaking, it would be easy to assume that Treat Me Nice would be somewhat dull. However, this is far from the case, as Jackson’s style is one that encompasses that which all students devour; a work that is fulfilling, compelling, interesting and, above all, quotable in any essay that surrounds the subject. From media studies to marketing (or how NOT to market a prized asset, in this case), students should find room for Treat Me Nice, if only to understand what it is that makes an academic study stand out from the crowd. As for those who are simply keen to read something new about a man who’s life has been turned over so often it looks like a ploughed field, this gives a refreshing insight into what is, it has to be acknowledged, a global phenomena that ultimately changed the face of popular culture forever. No 1950’s Elvis = no Rock ‘n’ Roll = no Beatles = etc. etc. For providing that pause for thought so adroitly, Howard Jackson should be roundly applauded if nothing else. A thoroughly enjoyable addition to the pantheon of Elvis literature that is currently available. I never cease to be amazed at the eclectic and bewildering themes contained in books around Elvis. From the uplifting Elvis Was My Speech Therapist by James Bradley, Christopher Byrnes Matthews obtusely challenging three volume set, The Name Code: The God of Elvis and Isabelle Tanner’s new age Elvis A Guide To My Soul to the politically motivated invective of Albert Goldman in his strident biography, Elvis and the sad ramblings of James Denson in Elvis Through My Eyes, the Elvis library is one which can easily enthrall, confuse or anger the reader. At the extremes there are two categories: books which challenge the reader in a serious way and books which are so ludicrous you cannot help but laugh at their ridiculous premises and sloppy presentation. Howard Jackson’s Treat Me Nice Elvis, His Music and the Frankenstein Creature falls into the first category. It is a cogently written and totally absorbing 386 page analysis of Elvis and his importance, framed in the light of Frankenstein author Mary Shelley’s warning against society’s lack of sympathy for uncouth creatures. Musicologists, whenever possible, are keen to point out the similarity of arrangements in his gospel music to the originals but, inevitably, Elvis moves beyond white gospel because of his always insistent, vocal identity. But the career of Elvis Presley, for all its achievements, marvellous moments and continuing longevity, is a tragedy of unfulfilled potential, wasted opportunities and embarassing baggage. Parker, like Elvis, was a sleepwalker but, unlike Elvis, he had a professional, psychiatric illness…… ……Despite major errors in his early life, Parker, like Frankenstein, was an unreliable narrator who misinterpreted everything. At one point the author even explores how Elvis would have reacted had he been born one musical generation later in the era of the singer-songwriter. Despite the traditional emphasis, the album is remarkable for its radicalism and the bold way old, country classics are redefined. Elvis gives the song an ascending arrangement so that it climaxes in a spectacular chorus. Done this way, it sounds like a march. The drumming emphasises this aspect. Ultimately, it succeeds because Elvis sings it so dramatically and fearlessly…….The passion increaes until the glorious end when one is tempted to cheer. If it had been performed in concert, it would have had everyone on their feet, crude, definitely, but irresistable. Both versions are fast and excellent but there are differences. The version by Charlie Rich rolls like a blues whilst Elvis is more frenetic and closer to rockabilly. Is the rubbish important or can it be safely ignored? Elvis has to be judged by his achievements and, as they are impressive, this has to be acknowledged. The achievements exist as an explanation of why so many think he is great and are still loyal and curious. The dross reminds us that he was flawed and badly managed and that his career had disastrous elements. The author also includes an intriguing chapter The Lists – The Neglected Legacy in which he examines various recordings and albums, rating each song. In Treat Me Nice, Howard Jackson presents a formidable treatise, a rich tapestry of insight, analysis, comparison and acute commentary. With particular aim at the shortcomings of the Colonel (who quickly was out of his depth in promoting an artist whose talent was effectively in a universe far, far away from the outdated country carny culture Andreas van Kuijk occupied; a universe the Colonel was unable to recognise or adapt to. Jackson’s passing observations are insightful ( musically ‘soulless producer Chet Atkins’) and his analytical dissections of politically or philosophically flavoored works, such as the Albert Goldman and Peter Guralnick biographies, enlivening! In considering the Guralnick two volume biography set, Jackson acutely observes that Guralnick’s biography, while rich in detail, is essentially procedural, and for this reason it fails to discover “the inwardness of what happened”. The lonely individual, who possessed to paraphrase Shelley a heart fashioned to be susceptible to love and sympathy and to vice and hatred when wrenched by misery, was not the hero Guralnick wanted. Treat Me Nice is not for those readers who want a straightforward and easy to digest biography of Elvis. This book is for those who want to stretch their thoughts and imagination, for those who want to explore and contemplate previously unrealised concepts. Essentially it is for those who want to challenge, learn and redefine the life and musical legend (and legacy) of the King of Rock ‘n’ Roll. Treat Me Nice also comes with a bonus CD: Elvis – Gothic Loner. The disc features 18 early Elvis recordings including Is It So Strange; Love Me, He Knows Just What I Need, Reconsider Baby; One Sided Love Affair; I Got Stung,Blue Moon and When It Rains It Really Pours. The song selection provides a nice portrait of the diverse musical influences which help shaped Elvis, both as a man and as an artist with amazing stylistic abilities. Verdict: Treat Me Nice Elvis, His Music and the Frankenstein Creature is recommended reading for those who want to be challenged and expand their understanding of Elvis Aaron Presley! Howard Jackson has written a fresh, complex and highly satisfying work which lingers in your mind long after you have read, digested and reflected on its intriguing subject matter. A pleasure to read – the book is well-written, very informative and extremely well-researched, with lots of little gems of knowledge as well as info and opinion on the making of key Elvis albums and tracks. The idea behind the book is very original, and to any sceptics out there the author definitely ties together the two characters of Elvis and Frankenstein’s creature very convincingly. For fans of Elvis, there are surprising insights made that I, as a life-long Elvis fan, had never thought of before. A must-read for fans of Elvis, music and literature as a whole. Just when you thought nothing original could be written about Elvis along comes Howard Jackson’s superb book. If you’re serious about Elvis, then this has to be a must read. I really enjoyed this book. I ought to say that I am not an Elvis fanatic. I do enjoy his music, and I respect his talent, but I am not a fanatic. I think the story of his life is one of talent, mismanagement, and tragedy. He is an intriguing and ‘larger than life’ character. This book is not an in-depth biography of his life, nor is it a complicated investigation of his music. It is a fan discussing Elvis’ music, the context and what influenced him – searching for an explanation for the tragedy and perhaps for why the fan is so passionate about it.The book makes a wonderful companion for the general listener. Read while listening to the music, it feels like having a conversation with an old friend who loves the music of Elvis. Settle down with a glass of wine, one of the track lists from the book, and enjoy Elvis at his best and you have a companion to enjoy the music with. And the Frankenstein metaphor works surprisingly well, providing a lense through which we gain a better understanding of the tragedies as well as the triumphs of Elvis. A very enjoyable read. Elvis Presley is a much-discussed icon of the 20th century and beyond and while I am a fan, I was beginning to despair that there was nothing new left to say about him and I would have to make do with me and my records. With this is mind, I count myself lucky to have discovered this book – offering a very original and insightful look into the life and perceptions of Elvis, finding previously undiscussed but now obvious parallels with the themes of Shelley’s Frankenstein. Us Elvis fans are very rarely treated to such a thoughtful dissection of the King, so I would highly recommend you do not miss this one. It’s a great concept and superbly written by an author who has expertise, talent and conviction in his subject. This would make an excellent Christmas present for an Elvis fan who is sick of the novelty tat (trust me, I speak from experience!). What I like about the book is that you finish the main book having enjoyed it but before you can be disappointed at it ending you discover a musical guide that has brilliant asides and insights. Love the review of It Hurts Me and how it is combined with Long Black Limousine. The appendices feel like a real bonus. This is not the lightest read on Elvis. There are times I would have probably preferred something not so challenging. But, I’m glad I have read it. Some of the concepts are unusual but it is always readable and now I do think about Elvis differently. A worthwhile book that is probably essential. Treat me nice is a book about Elvis Presley, his music and the Mary Shelley’s Frankenstein Creature. The author Howard Jackson has written short stories, crime fiction, a Travelogue on Brazil and music criticism before. Getting in touch with Elvis in the age of eight listening to his song Hound Dog on a TV programme called the Jack Jackson show causes a lifelong fascination with American popular music, especially from the South. So Howard Jackson says: “My name you already know. I am an Elvis addict”. On the basis of the authors detailed knowledge he uses Elvis life in terms of major events, important persons, Elvis songs and films to show Elvis talent, his merits and failures. And in reference to classical and modern literature and movies he brings Elvis significance in a wider cultural aspect. In the end Howard Jackson shows that Elvis similar to Frankenstein creature was a victim of music industry and society not being able to cope with an outstanding personality. 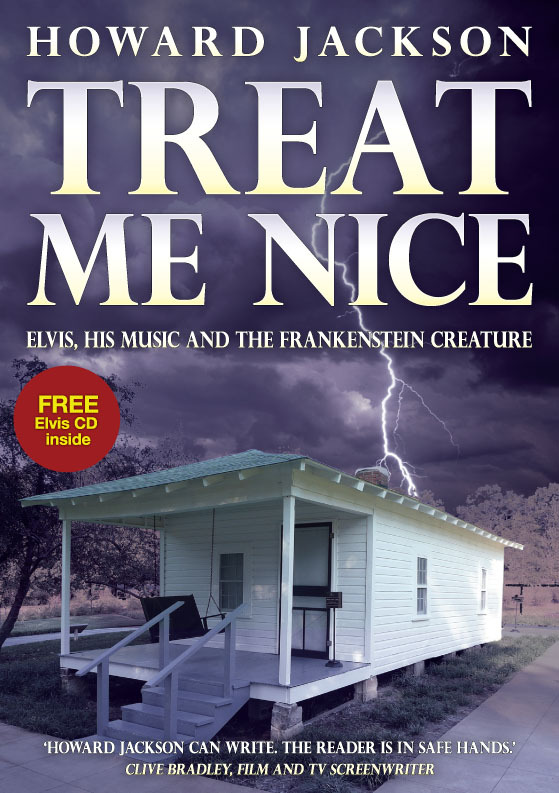 Treat Me Nice gives surprising insights and is a kind of bible for all Elvis fans. And for me, a non-Elvis-fanatic, it is a challenging, enjoyable and unusual book. Listening to Elvis music gives me much more than before and I understand why Elvis is so important to his fans. And Howard Jackson has a beautiful poetic language I can always listen to. Treat me nice comes together with a terrific cd with many lesser known Elvis songs and it includes “The List” with 15 lists that were called “The Curse of the Neglected Legacy”.